Supreme Lobster is partnering with one of Chicago's most popular annual charity events, the 20th Green Tie Ball --themed A Return to Emerald City -- to benefit Chicago Gateway Green. Supreme Lobster will feature its final round of the Chicago Summer Chef Challenge Series at the September 17 gala. Over the years, these Chef Challenges have engaged groups of Chicago's top culinary icons in competition, pushing the boundaries of artistic expression and creating city-wide trends in the restaurant industry (competition is limited to the VIP tent only). This year, the live head-to-head battle of the Culinary Titans, takes place in the Green Tie Ball's VIP area at A. Finkl & Sons, 2011 N. Southport, Chicago. The list of guest judges this year includes Louisa Chu, nationally recognized chef and culinary journalist; Kate Bernot, Contributing Editor of NBC's culinary blog The Feast; and Chef Aaron McKay of the Executive Dining Room at Hyatt Chicago, alumni of NoMI, Schwa and winner of the previous Chicago Summer Chef Challenge Series. For years, being a guest judge for the Chicago Summer Chef Challenge Series has been an industry-only honor, however, this year the rules are about to change! The Hawaiian Chef Challenge, the biggest culinary challenge yet, will include one very lucky "Chicago civilian" among its judges. When you purchase a $250 VIP ticket to this year's Green Tie Ball, you automatically will be entered into a raffle to be seated at the judges table during the Chef Challenge Final Tasting Round. Here's your chance to collaborate with fellow judges, an esteemed group of Chicago's culinary elite and your critiques will award one lucky Chicago Chef the $1,000 Grand Prize. In addition, one lucky attendee will be awarded a pair of round-trip tickets for a Hawaiian vacation courtesy of CS Magazine and Chicago Gateway Green. General admission tickets start at $125 per person and can be purchased at www.gatewaygreen.org. For more information about Chicago Gateway Green, call 312-540-9930. 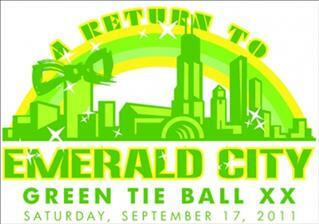 For information about the Green Tie Ball, visit greentieballblog.com or www.chicagogatewaygreen.com. Dedicated to greening and beautifying Chicago's expressways, gateways and neighborhoods, Chicago Gateway Green was founded in 1986 to benefit the environment and improve the quality of life for millions of Chicagoland residents and annual visitors. A 501c3 non-profit organization, Chicago Gateway Green makes an impact in the community with three key programs: Expressway Partnership, transforming city roadways into landscaped parkways; the International Sculpture Program, beautifying gateways through the installation of public, international art on expressways; and the Tree Partnership, a large-scale tree planting initiative that transforms unused land into green spaces. Chicago Gateway Green is a non-profit organization and has broad support across the region's business and civic community, and serves as a model for effective public-private partnerships. For more information visit www.gatewaygreen.org or call (312) 540-9930.